Good morning & welcome to another 3-D Wednesday! Sorry I have no video for you today :( I was soooo exhausted last night, that I am surprised I made something! ;) I am SO HAPPY that I did because I LOVE how my tag came out! I LOVE how my older stamps /products look AMAZING w/all of my new goodies! I got to wipe the dust off of my "Anyday Bingo" stamp set. This stamp set is one of my FAVES because you can make it for any holiday of your choice~! When I designed my little ghost , I knew I wanted to pop him up onto this bingo stamp! I thought it would look cute layered onto my doily die! This was definitely a SUPER SIMPLE tag! Weren't these 3-D projects FABULOUS??? OMG! I am ALWAYS in AWE of my team's talent! Well, I hope we inspired all of "YOU" to make yourself a 3-D item today! Oh Miss Emma what a spooktacular tag. Your little ghost is so stinkin' ca-ute!! I love too how you created using your oldies with your newbies. You sure put the "FUN" in craftin'. I am glad too that you were able to make something for today because I don't much like it when you aren't feeling well at least you are feeling good and not surprised you were tuckered out after all girl you are soo busy and even when it is fun stuff. Hope you have a wonderful Wednesday and are able to squeeze in some craftin' fun!! Your tag is super cute, Emma! Love those papers! We both must have had Bingo on our minds yesterday! What a gorgeous tag! I just love all the old and new! That's why I love your products so much!!! DT projects are incredible!! So inspirational! Cute Tag! Love the way you embellished it:) Thanks for all the inspiration DT! Beautiful Tag! Love the doily! And awesome projects from the Team!! Oooh Emma, your tag is so fun! 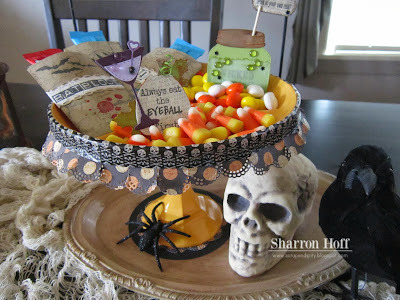 I just love all the Halloween inspiration! Your Dt is amazing and always so CREATIVE!!! These are all AWESOME Emma!! Your DT is the best!!! Loving all the Halloween inspiration!! Emma ~ I just don't know how you do it but your tags ALWAYS look so INCREDIBLE!!! I LOVE all the little details, the papers and of course the MCT products! WOW ~ the DT's out did themselves this week! LOVE everyone's projects!